What does this mean? Is the company blaming or angry at its users for spreading it’s software around the country? 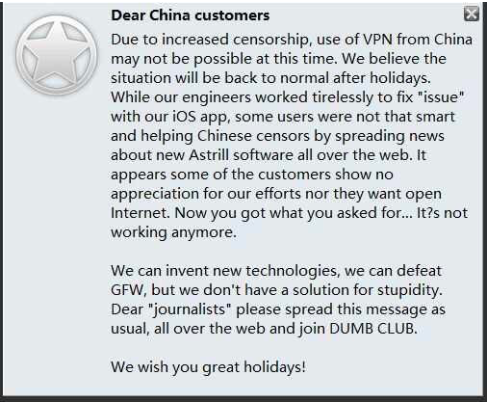 Users of Astrill, one of the VPN services used in China, are seeing an odd message pop-up like this: What does this mean? Is the company blaming or angry at its users for spreading it’s software around the country? A VPN is usually used to protect your privacy. But in many situations, a VPN is necessary to circumvent censorship or website blocks. When we think of censorship or blocked websites, we often think of China or Iran, which filter and block thousands of IP addresses, websites, and specific pages or URLs within websites. But most other countries also engage in disrupting or blocking websites. For example, the United Kingdom has blocked Wikipedia, WordPress.com, and Archive.org. There is a growing and updated list here that lists website blocks in the UK. It’s important to monitor this list occassionally to be informed of new and important updates. True, many of the sites that get blocked are torrent sites that infringe on copyrights, but many others are blocked for more ulterior or business motives. VPNInstructions.com has unveiled a new partnership discount code with VPN provider Kovurt.com. from now until the end of October 2014, use the discount code “vpninstructoct2014” on the checkout page for a 50% discount off any Annual Plan. Kovurt.com has both Solo Annual Plan which gives you unlimited bandwidth and one concurrent connection. Also Kovurt has a Pro Annual Plan that also has unlimited data bandwidth plus up to 3 concurrent connections. A 50% discount is a fantastic deal and it’s a great way to keep your Mac or Windows computer Internet activity private and safe! Why Are VPNs Important For Americans Overseas Who Monitor Credit Reports? Americans living around the world have their credit rating to worry about, and the federal government and private industries in the USA has made it simpler over the years for Americans to monitor their credit reports. 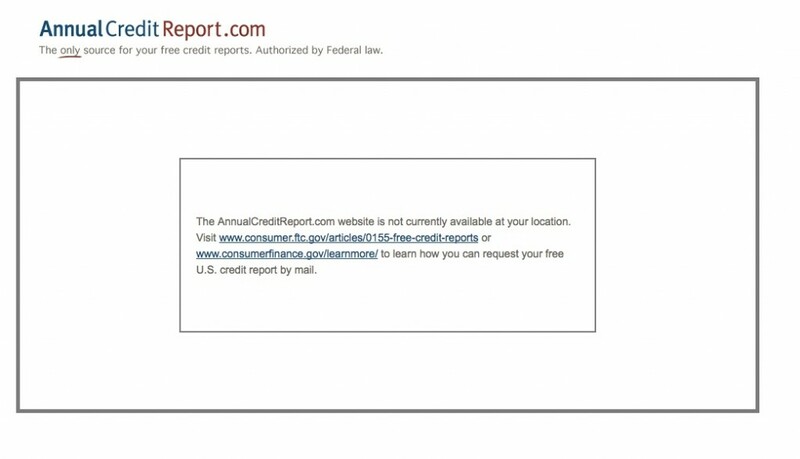 The AnnualCreditReport.com website is a venture by the biggest credit rating agencies to allow Americans one free report each year. So this free service that keps Americans aware of errors in their credit reports, problems with their finances, and issues with possible financial crimes, is off-limits to Americans living outside the USA! But there is a solution. 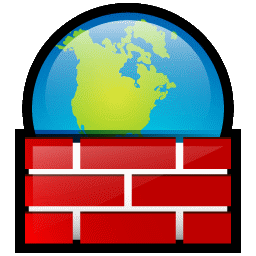 A good VPN (virtual private network) allows an American overseas to appear as if they are using a computer in the USA. That way, they can access the AnnualCreditReport.com site with no problems. Why is AnnualCreditReport.com blocked to people outside the USA? Most likely it is a security issue to thwart phishers and hackers emanating from non-USA IP addresses. Or it could just be a big middle finger from AnnualCreditReport.com to all the American expatriates living abroad. Asia is home to a new virtual private network startup. Danny Levinson, an American technology entrepreneur who has successfully grown and exited Internet ventures in China over the past nearly 20 years, is focusing on online privacy with his latest venture named Kovurt based in Hong Kong. Hong Kong is also the first outpost Snowden fled to once his spying revelations came to light. Kovurt calls itself an Internet privacy fix and is aiming at providing cheap privacy solutions for users around the world. Kovurt began a couple years ago when Levinson was creating free virtual private networks for friends’ companies operating in China, and he morphed it into a business recently and already claims thousands of free and paid users. The company is providing mobile apps and desktop software to aid users to maintain privacy on wireless networks so that snoopers and malware don’t harm users’ data. The company is headquartered in Hong Kong’s Cyberport, where many Internet startups are based, and has staff working in Scotland, Beijing, Delhi, Moscow, and Seattle. The company has been self-funded by Levinson the past two years and reportedly is not seeking any investment in the near term. Levinson says he is focused on growing his paid customer base and investment may be necessary for jumping further hurdles in the future. Levinson’s two most recent ventures were one of China’s largest vertical business media news groups which sold to private investors, and a Cloud-based social media aggregation and distribution service that incorporated email marketing and social media monitoring that was acquired by Nasdaq-listed Vocus in the United States.